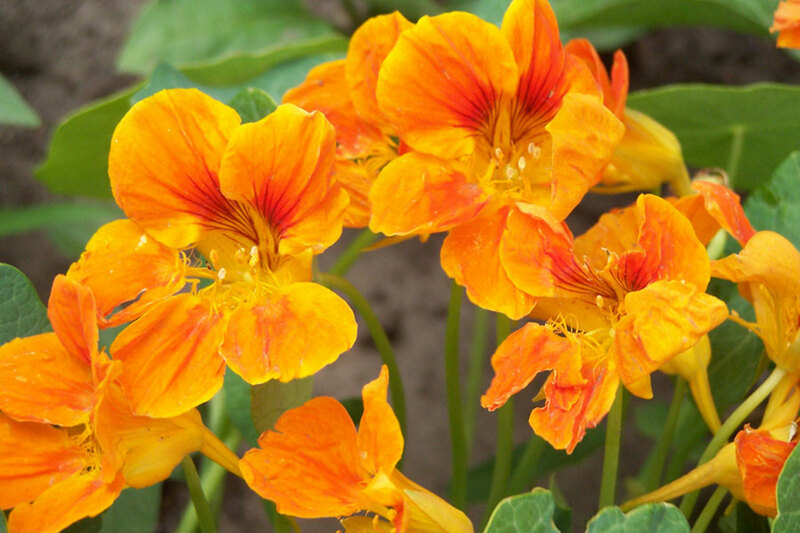 Note: Nasturtium as a common name, refers to a genus of roughly 80 species of annual and perennial herbaceous flowering plants in the genus Tropaeolum. They have showy, often intensely bright flowers, and rounded, peltate (shield-shaped) leaves with the petiole in the center. The flowers have five petals (sometimes more), a three-carpelled ovary, and a funnel-shaped nectar tube in the back. Foliage description: rounded, peltate (shield-shaped) leaves with the petiole in the center. Fertilisation: Don’t fertilise as this causes prolific leaf growth at the expense of the flowers. Pruning: Not requiried except cut back to keep the plant from growing wild. Insects: Aphids are attracted to Nasturtiums which will (hopefully) keep the aphids off your prized roses and other ornamentals! 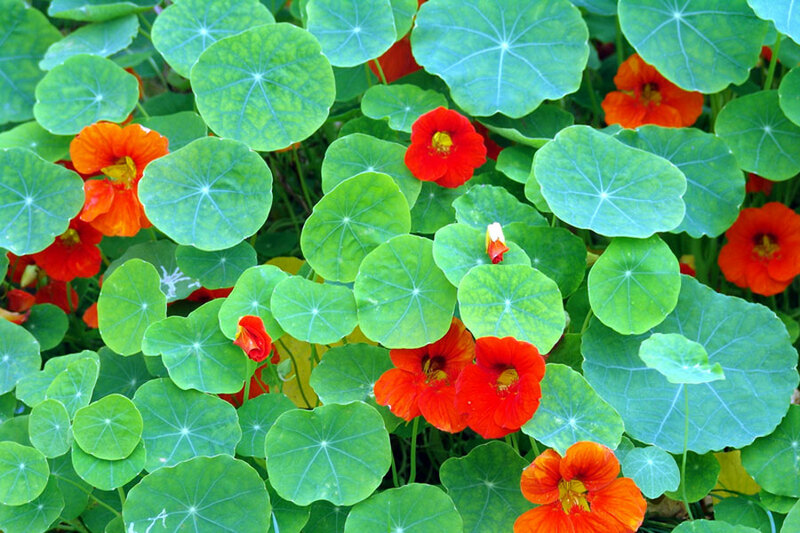 Other notes: In cultivation, most varieties of nasturtiums prefer to be grown in direct or indirect sunlight, with a few preferring partial shade. The most common use of the nasturtium plant in cultivation is as an ornamental flower. It grows easily and prolifically, and is a self-seeding annual. They go from seed to bloom very quickly. Nasturtuims are great for beginners as they are easy to grow. The peppery-tasting leaves are sometimes used in salads. 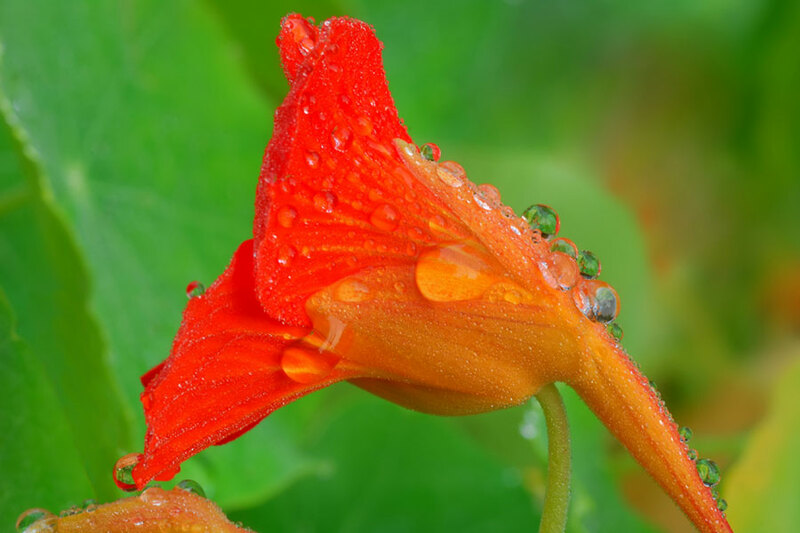 The brilliant yellow, orange, or red flowers are funnel-shaped and have a long spur that contains sweet nectar. 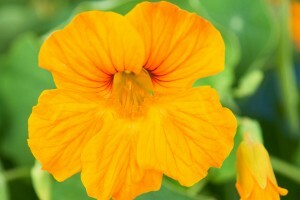 Growing Nasturtiums as pest control for your veggies!